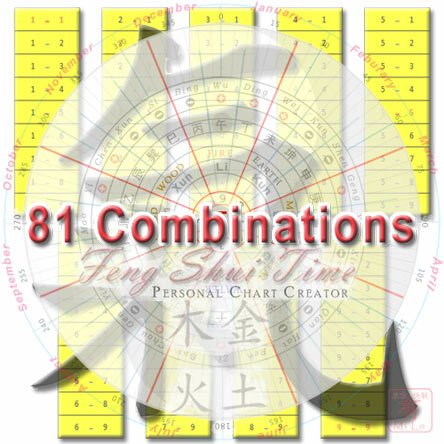 Xuan Kong Flying Star Feng Shui Time – 81 Star Combinations. In Xuan Kong Feng Shui each star is allocated a number and each star has an Element, Mountain and Trigram, these stars/numbers are constantly moving and interacting with each other. For this exercise we just concentrate on the Number and Element. Let’s take a lotto machine and remove every other number except 1,2,3,4,5,6,7,8 and 9 (OK 1 to 9), so we call this machine fengshui1. Now we do the exact same thing with a 2nd lotto machine and call this one fengshui2. Now we run both machines100’s of times and only record the first number out each time, we would get random 2 number sequences like 3-2, 4-9, 3-3, etc. So the most possible unique combinations would be 81. Let’s go back to our lotto machines and instead of random numbers fenghui1 produces a number unique to your birthday and fengshui2 produces a unique number for any date you wish past, present or future. Now we have your birth number which is constant and a variable number based on time past, present or future. Sample date and time based on Ex-President JF Kennedy. JF Kennedy Died = 22/11/1963, FST info for this day was Number: -9, Trigram: Li, Mountain: Wu , Element: Fire. 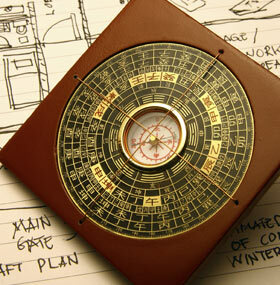 Classical Chinese Feng Shui heavily relies on the 9 Stars and it basically recognition 81 possible Star combinations. Typically, certain distinct qualities will be allocated to these combinations. When you have been a practitioner already, most of these Star qualities will be known to you, but before we proceed, Lets look at some basic and fundamental considerations that should keep mind before we at all commit the knowledge of these 81 Star combinations to actual practice. As practitioners of Xuan Kong Fei Xing Pai, commonly referred to as Flying Star Feng Shui or also Qi Distribution School, we practice our ability to Read the Stars.We must however, apply the indications shared here – and even present the combos – with ample reservation, because, as always, lists and tables are only just quantifying Qi and are in no way to be taken rigidly. Analysis the Stars or Reading the Stars are not synonymous.It would be best to share this information. Before we can decide what a combination may actually portent we need to factor in a vast string of considerations, all simultaneously and this of course takes experience.Star combinations as such may or may not take the Timeliness factor of the Stars into account. You should have a firm understanding of Sheng, Wang, Tui and Siduring different Feng Shui periods before you even attempt apply the subject in actual practice. It should be clear for example, that 5-7 is an inauspicious combination out of Period 7 (1984-2004), because 7 is only auspicious in its own Period. Out of its own Period, 7 is not only untimely but it can be also detrimental (Military Star, generally unfortunate). In its own Period, when Star 7 is Wang (prosperous), Star 7 may be able to handle Star 5. Outside its own Period, Star 7 will become more feeble and perhaps much less able to handle the ill portents of Star 5 and we would need the then Noble Star (e.g. Star 8 in Period 8 which runs from 2004-2024) to handle the situation.